A 1-0 victory over Slovenia prevented me from writing this very piece in March. Results against England, Lithuania, Malta and Slovenia again delayed it further. I was even hoping I’d get to wait until after our capitulation in the playoffs to write it, but unfortunately, we couldn’t even make it that far. The fact of the matter is it has always been coming. I, like many others, have had my mind made up about Gordon Strachan for a long time now. I could tolerate him, though, IF we were getting results. I could tolerate his sneering attitude towards fans and the media. I could tolerate his sly digs at the domestic game he’s supposed to talk up in his various punditry appearances. I could tolerate his “favourites” and increasingly bizarre squad and team selections. I could tolerate his apparent complete lack of tactical knowledge. I could tolerate it all if there were clear signs of progression on the park or at least a semblance of Scotland going forward. There isn’t though, and there hasn’t been for some time. Strachan was a popular appointment (anyone replacing Craig Levein would have been) but he was liked by most supporters and had quite a few friends in the Scottish media. There was a genuine feeling he could finally be the man to take us forward, and results against Croatia and Poland early on in his tenure only added to that. In fact, up until the Republic of Ireland away match, things were all sunshine and rainbows. Then it all went wrong. 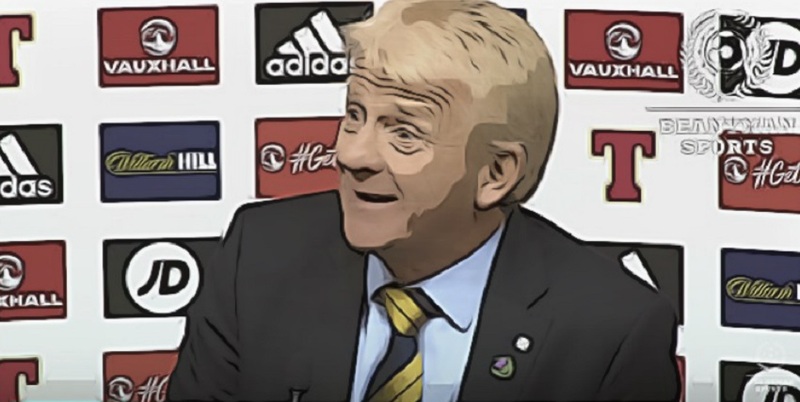 Simply put, Strachan was presented with two realistic chances of reaching a major tournament and failed. Not even making third in the last qualifying campaign was criminal. Finishing behind a bang average Ireland when even second was in our hands at one point should’ve seen heads roll. Obviously, it didn’t, and Strachan was serenaded off against Gibraltar free to lead us blindly into the next set of qualifiers. The World Cup group, slightly more difficult? Sure. We were given one of the worst top seeds, though, as well as Slovenia and Slovakia, who aren’t actually that much better than us. We failed. Not to stroke his ego or anything, but we’d have failed even earlier if Brendan Rodgers hadn’t shown up at Celtic and properly coached half our national team on how to play football. It is no coincidence that the more domestic-based players we got in the national team, the better we got. Strachan, as well as others in this country, and their apparent fixation with the English Championship has held us back greatly. It’s a better league than the Scottish Premiership, obviously, it’s one of the richest in the world, but the standard of football and player in it isn’t much different. Players that choose to play their football down there for the money and chance to move to the Premier League shouldn’t be rated higher than those playing well at home, it’s that simple. We literally do. Scotland has a better squad and better resources than the Republic of Ireland, Northern Ireland, Serbia, Iceland, Hungary and you could perhaps even argue Wales. They’ve all been to a major tournament more recently than us, they’ve mixed with and occasionally beaten the powerhouses of international football. The majority of Northern Ireland’s players come from the English lower leagues and Scotland, their main strikers are KYLE LAFFERTY AND JOSH MAGENNIS, they’re heading for the playoffs. Michael O’Neill even came under scrutiny last weekend for their 3-1 loss to Germany. A Germany side that the Republic of Ireland took 4 points from in the last campaign. We of course took nothing, but it was shrugged off as “it’s Germany, what you gonna do?” That worked out well, eh? Strachan has blamed the national team’s failings in the past on “not having a Bale or Lewanowski” to single-handedly drag their gubbins nation across the line. You now who else doesn’t though? Everyone that is not Wales and Poland. Unless he rates the likes of Jon Walters, Josh Magennis and Vioar Orn Kjartansson much higher than the rest of us then that is complete and utter nonsense. Especially when Wales and Poland have shown themselves both capable of both picking up points without their star men. It is up to the manager of the national team to get the best out of the group of players he has at his disposal, not moan about the ones he doesn’t. Strachan has not done that and shown no evidence he’s going to learn how to anytime soon. I don’t even want to discuss the “genetics” comments which I’m sure will be picked apart for weeks on Sportsound. There’s nothing to them. They are the inane ramblings of a man so utterly out of his depth, trying to further deflect blame away from himself. I’d have more respect for Gordon Strachan if he’d drop his wee jokes and his “we’re not here to talk about my future” spiel and took some responsibility for once in his Scotland tenure. Put his hands up and say “I got it wrong” rather than blame it on science. He won’t though, he’s too stubborn, and that’s ultimately his downfall. Obviously being tactically inept hasn’t helped him, but surrounding himself with yes men and refusing to take criticism from those who aren’t real “football people” has made him a dead man walking. Keith Jackson may still try and defend his pal, but Keith Jackson has about as much credibility as me at this point. Strachan is finished, and if it isn’t only a matter of time before the SFA come to their senses and get rid, then god help us.